Two international cruise operators will sail their luxury ships to China next year, ready to take advantage of the growing cruise travel market. 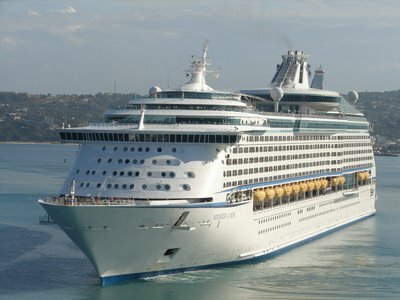 Miami-based Royal Caribbean Cruises said it will add a new luxury cruise ship to its Chinese routes next year. The new ship – the 138,000-ton Voyager of the Seas – is twice the size of the Legend of the Seas, which is the largest cruise ship visiting Chinese ports. Also, Genoa-based Costa Cruises has announced it will introduce the 75,000-ton Victoria to China next year, a move which will increase the company’s capacity in China by 40 percent. Michael Bayley, executive vice-president of Royal Caribbean Cruises, said at the sixth conference of China Cruise Shipping in Tianjin that China still has a far lower penetration rate compared to cruise markets in the United States and Europe, but this means there is "huge untapped potential". "We are encouraged by the increasing number of Chinese tourists who choose our cruises and the positive feedback we have received from the market," he said. A total of 223 cruises visited the Chinese mainland last year, a year-on-year increase of 43 percent, said Wu Wenxue, vice-president of the China Tourism Association. Among them, 95 cruises departed from the coastal cities of China, a growth of 18.8 percent year-on-year, Wu said. According to industry figures, the number of mainland Chinese traveling outside the country on cruises reached 790,000 last year, up 20 percent over 2009. "Cruise travel will embrace a golden period in China over the next five years," Wu said. "Traveling overseas on a luxury cruise will become the choice of more Chinese tourists." With the rapid growth of the domestic cruise travel sector, international cruise operators have started to cater for Chinese passengers, said Pan Ximing, director and general manager of Hong Kong-based Kamking Cruise Travel Group. Signs showing the change include more Mandarin services provided on board, he said. Li Jinyu, a tourist from Shenzhen visiting Hong Kong, said she enjoyed her first cruise to Hong Kong in July this year. "My friends recommended cruise travel to me," Li said. "It is more worthwhile spending a night on a ship than staying in a hotel." Li said the cost, around 1,000 yuan ($157) for the two-day cruise, was affordable. Governments have also offered strong support to the cruise travel industry. In August, the ministries of transport and commerce adopted a new policy that allows foreign cruise operators to set up solely foreign-owned companies in China. Song Dexing, head of the water transport bureau under the Transport Ministry, said that the policy allows foreign cruise operators to deal directly with customers in China, such as doing their own advertising and ticket sales. In the past, international cruise companies had to work with domestic partners to operate in China. The ministry recently approved Costa Cruises’ application to set up a solely foreign-owned enterprise operating in China, a ministry official said. Despite the promising market, experts said the cruise sector will still face some challenges. Huang Ruiling, general manager of Mediterranean Cruises Travel Agency (Shanghai), said it is still essential for cruise operators to promote the concept of cruise travel to Chinese consumers, as some misunderstand it. For example, some link cruise travel with the passenger ships along the Yangtze River and have no idea of the luxury services available on a cruise, she said. Also, it is important to provide training to local travel agencies so they can offer more professional guidance to consumers, Pan said.